16 ft Arima Sea Chaser purchased new in Sept . Repowered last year with a New Light Weight Yamaha 70hp. Current hours on Main Engine are 105 hours. 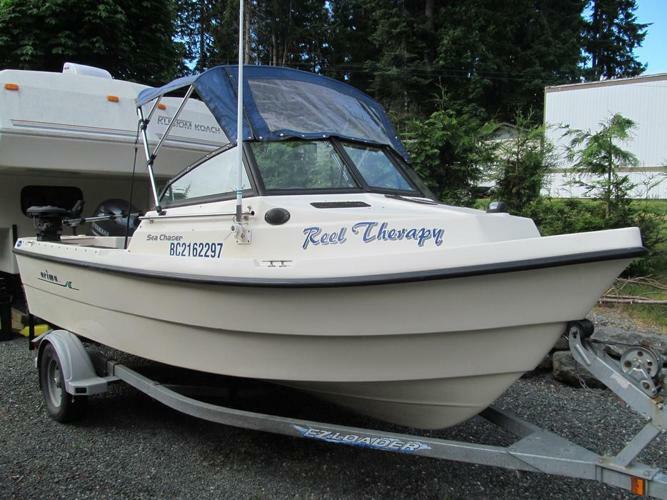 Boat includes Older 7.5 Honda Kicker running perfectly with heavy duty Kicker Mount, Newer Electric Scotty Downriggers, 45 liter Main Gas tank with Water Filter, plus 2 Additional 25 Liter Saddle Tanks, Basic Sounder and Fish Finder, Quality VHS Radio, Anchor, Anchor Line and chain, Bow Lines, Bumpers, Canvas top, and boat covers for trailering and winter storage, Bilge pump, nav lights. Boat will plane at about rpm and best economical speed is at about to rpm which is approx. 25 miles per hour. Top speed is approx. rpm or about 33 miles per hour. The three tanks will allow for approx. 95 nautical miles at cruising speeds making it very economical to enjoy. Approx. $38,000 plus invested in this boat. Asking $27,000. Serious offers only. I have all paperwork to transfer to a new owner. Boat Hull still has a 3 year warranty and Main Engine still has 2 year warranty which can be extended.